Isabelle Hains and Delalene Harris Foran, President of CUPE 1253 speak to the media at a press conference held December 1, 2010 in Fredericton. 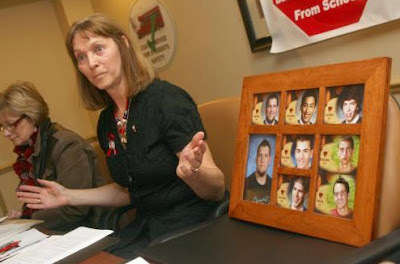 (Bathurst, NB - December 17, 2010) - A Bathurst mother whose son was killed along with seven others in a tragic passenger van collision three years ago says the province is "playing Russian Roulette" with the lives of students who travel to extra-curricular events. Isabelle Hains says that a December 11 incident involving a vehicle carrying a hockey team from Dalhousie to Miramichi shows that the safe transportation of students to extra-curricular activities "is not the top priority of the New Brunswick Department of Education." "All I know is that the Department of Education says one thing, and the reality is another," says Hains. "Children continue to be transported to extra-curricular activities in unsafe vehicles and I am left with no other conclusion than they're just waiting for another tragedy to occur." In the most recent incident, the wheel nuts on two back tires of a Multi Function Activity Bus (MFAB) transporting a hockey team from Dalhousie to Miramichi were found to be loose after the driver noticed the vehicle wasn't operating properly. The MFAB is operated by the École Aux Quatre Vents in Dalhousie. The MFAB passed a Motor Vehicle Inspection on November 30 at which time it had winter tires installed. According to reports, the person (not the driver) responsible for the MFAB was supposed to bring the vehicle back into the garage and have the tires checked before it reached 80 kms but it appears this was never done. Meantime, the vehicle was used for nearly two weeks before the loose wheel nuts were noticed on December 11. Hains wants to know who was responsible and what the Minister of Education is going to do about it. She says she is worried that the system designed to protect students in the wake of the Bathurst tragedy is in the hands of volunteers who may be well intentioned, but who "lack the professionalism and skill to carry through with the very serious burden that has been placed on their shoulders." "I wonder if the person who was supposed to bring the MFAB back to the garage after 80 kms was a teacher who, in addition to his or her regular duties, has been assigned the responsibility of making sure the vehicle is maintained properly," asks Hains. "If it is a teacher or another volunteer, then the time is long overdue for a new approach to student safety in New Brunswick." 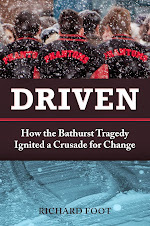 Hains says this is the second time in one month that students' lives were endangered and she asks if the Department is willing to accept another Boys in Red Tragedy before doing the right thing and hiring professional, Class 2 Drivers, as called for in the Bathurst Coroners Inquest of May 2009. Calling the Dalhousie incident "unforgiveable", she says the province has to get serious about student transportation safety if it expects to have the confidence of parents who allow their children to participate in school sports. 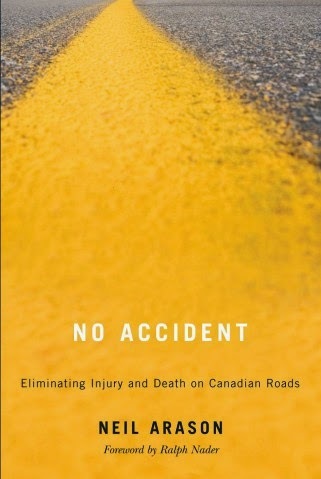 Hains has been lobbying the provincial and federal governments for improved school transportation safety since the Boys in Red tragedy in January, 2008. On December 1, she met with the Minister of Education, Jody Carr and Minister of Public Safety, Robert Trevors, to discuss a November 25 incident in Sackville where 60 children were transported to Halifax in chartered buses with worn tires. Within days of the November 25 incident, Prestige Bus Service of Sackville was barred from transporting New Brunswick students and was facing charges in Nova Scotia. Hains was asking for charges to be laid by the NB Department of Public Safety under the Motor Vehicle Act and for District Superintendent, Karen Branscrombe, to be reprimanded by the NB Minister of Education for failing to fulfill her duties as called for in the Education Act. In his response, the Minister of Education promised to form a stakeholders group in the new year with a view to discussing the problems and solutions to student transportation safety. At the same time, the Minister of Public Safety said the bus company was under investigation. But in a report released December 3, Jody Carr concluded that Education Department employees followed policy in the Sackville incident and that there would be no reprimand for anyone. And nearly one month later, the NB Department of Public Safety has yet to lay charges against Prestige Bus Services.